If you need instructions this specific, just lick yourself clean and please don’t touch my food. Little things bother me. They cause me to question why they exist, and that can get troublesome. See? That’s something terrifying I had never considered before. 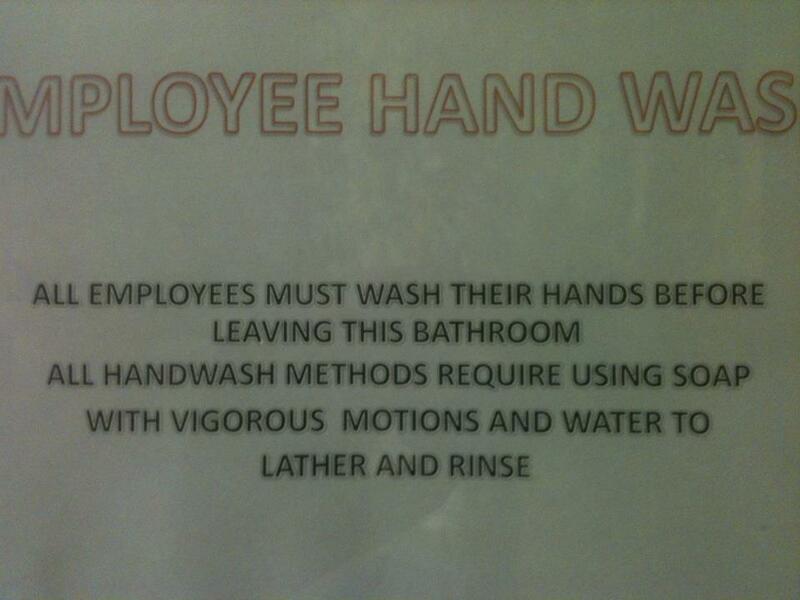 All these years I thought “Employees Must Wash Hands” said it all. It never dawned on me that our educational system might be falling down on the job in teaching people to clean themselves. The circumstances that led to this restaurant putting up this sign are a bit stomach-churning, too. Did the manager see Dingo the waiter go into the bathroom and drop a deuce, then just wave his hands under the faucet, wipe his hands on his pants, and get right back to slinging nachos? And was I eating there that day? I’ll tell you, if I was there the day they put that sign up, I might just go home and check into the toilet with a couple of months’ worth of Sports Illustrated, assuming I was going to be there for a while. And why the sign? Why go public with your scatological failings? To me, that indicates a clear communication problem in management. Just sit the guy down and tell him to scrub up. There’s no need for a sign. And really, if the kid can’t get washing his hands together, I’m not sure posting a sign is going to help. You shouldn’t have to call an employee training session just to get somebody to fathom the concept of lathering up. Perhaps you should just show him nature videos of a raccoon washing his paws in a river, and he might get the hint. — Reid Kerr hates the electric eye faucets at Walmart that require you to pretty much rub your hands on the sink. This entry was posted on Tuesday, November 20th, 2012 at 1:50 am	and is filed under Musings. The entry is tagged under You can follow any responses to this entry through the RSS 2.0 feed. You can skip to the end and leave a response. Pinging is currently not allowed.